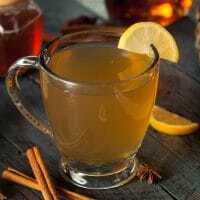 This Hot Toddy Recipe for a Cold tastes great and makes you feel so much better when you are feeling crummy. This is the best home remedy for colds using ingredients most of us already have on hand. Pour the bourbon, honey, and lemon juice in a 6-ounce mug. Top off with your hot water or brewed tea.